Public Policy Polling stands out among polling firms for their partisan, often times combative nature. This finding represents a net 6 point deterioration in approval for McDonnell's job performance since PPP's last poll in January (48/35%), and represents their lowest net rating for the Governor since July of 2012. But more significantly, the above finding represents a fairly significant departure from every other pollster to test the Virginia Governor's job approval this year, or even since taking office in 2010. Just consider Quinnipiac University, which released a survey on Bob McDonnell's job approval rating less than two weeks before PPP. They found McDonnell's overall net job approval rating to be 3 TIMES higher than PPP (49/28% vs. 44/37%), while his rating among whites was DOUBLE PPP's finding (50/29% vs. 48/36%). Meanwhile, there's an astounding 30 point spread between Independents' views on Gov. McDonnell's job performance (54/27% per Quinnipiac, and 39/41% per PPP). McDonnell's lowest rating this year besides PPP's most recent survey came in January, when he hit 48/35%, from none other than....PPP. Every other polling firm this year has found McDonnell between +21 and +37 in terms of net job approval/disapproval. Yesterday, Public Policy Polling released their second Virginia Governor poll of the year, with very little changed from the last survey in January. Terry McAuliffe (D) maintains his 5 point lead over Ken Cuccinelli (42-37%), while McAuliffe's net favorability rating fell slightly, and Cuccinelli's rose slightly. Oh, and in a rare move, the number of undecided voters actually increased from 13% to 21% since the last survey 5 months ago. At the same time, PPP finds the Virginia electorate remains largely unchanged as well. Five months ago, Democrats held a 3 point partisan identification advantage (35% Dem, 32% Rep, 32% Ind), which is now down to one point (34% Dem, 33% Rep, 33% Ind). The racial identification findings from January and now are virtually identical (74% white, 18% black, 8% other), as well as ideological I.D., age I.D., gender, and '2012 vote'. But how does the PPP electorate compare to the one found by exit polls in 2009, when Republican Bob McDonnell defeated Democrat Creigh Deeds in a landslide? In most ways, it's similar, with one big exception. White voters comprised a slightly larger slice of the electorate in '09 (78%) than what PPP finds now (74%), but not enough to significantly alter the poll results. The 2009 race featured an R+4 party I.D., while PPP finds D+1 (again, the difference is not enough to substantially change the survey result if reweighted). PPP also finds a larger gender turnout gap than seen in 2009, as well as a slightly older electorate, but nothing that would change the fundamentals of their topline. The one exception to the above paragraph can be seen in the crosstab regarding the 2012 vote. Often times, pollsters will ask respondents who they voted for in the previous presidential election, mostly to get an idea of how the pool of survey takers compares to the prior presidential electorate (this question was frequently used in survey analysis in the run-up to the South Carolina 1st Congressional District special election between Mark Sanford and Elizabeth Colbert-Busch to gain insight into the strength of GOP turnout). As has been noted here before, off-year, non-presidential races have a tendency (though not always) to attract less Democratic friendly electorates than in presidential years (see the 2010 vs. 2008 general election exit polls). But that is not the case in either of PPP's Virginia Governor polls. In both surveys, 49% of respondents say they voted for Barack Obama in 2012, while 45% claim they supported Mitt Romney. 6% say they supported someone else, or do not remember. 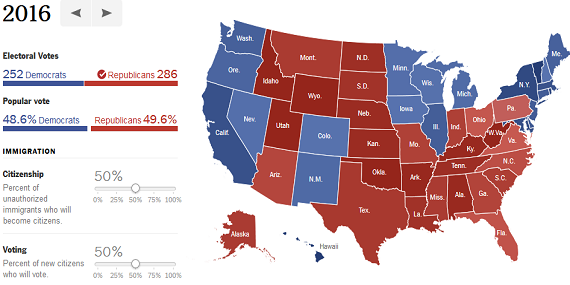 That's an identical margin to the actual result in Virginia last November, when Obama carried the state 51-47%. Joe Miller and Lisa Murkowski debate just prior to the 2010 midterms. According to polling, Miller would lose to incumbent Mark Begich in a landslide in 2014. Photo by Al Grillo, courtesy of Corbis. Caught up in a media world that that not only longs for, but demands competitive, theatrical political races, it's easy to gloss-over those contests lacking in the "drama" department. And what makes a better political contest than a close one? One where candidates are evenly matched, funded to the tee, and stir the emotions of their supporters and detractors? But alas, the soap-opera contest cannot always be. Landslides are occasionally inevitable (usually involving a particularly strong incumbent or an unusually weak or unpopular challenger). Sometimes, however, they're entirely avoidable. And yesterday, the 2014 Alaska Senate race took one big step closer to becoming one of those avoidable landslides for the GOP. Yes, the Alaska Senate race features a one-term, relatively unknown Senator defending his seat for the first time in a state with a decidedly Republican slant. It's certainly not a state where you'd expect a freshman Democrat, elected by one point in a wave-Presidential year, to be in a position to win a midterm reelection overwhelmingly. But fortunately for Senator Mark Begich (D-AK), the only Republican challenger making clear signals about running is a man who is despised by his state's general electorate, and underwater with members of his own party... Joe Miller. So what happened to the man who came painstakingly close to becoming Senator just two and a half years ago? What caused the guy who defeated incumbent Lisa Murkowski in a Republican primary to become so disliked within his own party? A series of ethical and ideological controversies that emerged near the tail-end of his almost-successful 2010 Senate campaign seem to be the catalyst, and his narrow Senate loss and subsequent law-suit to challenge the results did little to stop the bleeding. Though whatever the cause of the once-rising Conservative stars' fall, the consequences seem pretty clear. Alaskans say they would vote overwhelmingly to reelect Democrat Mark Begich if their second option is Republican Joe Miller. Not only that, but Alaska REPUBLICANS would just assume have anybody else - any potential Republican candidate - as their nominee in 2014. In nearly every possible Alaska GOP primary match-up one could imagine, no matter the ideology or number of candidates running against him, Miller winds up as the LAST choice of Alaska conservatives. Meanwhile Gov. Sean Parnell is the most formidable 2014 Alaska Republican in the primary, with Sarah Palin being the second most formidable. Massachusetts has seen a fairly rapid turnover rate in the U.S. Senate after Sen. Ted Kennedy's death in 2009. Before then, the liberal lion served with Junior Senator John Kerry since 1985. Since then, Kerry served briefly as Senior Senator along with Scott Brown (R) from 2010-2013, when Kerry was nominated as Secretary of State, and Brown lost reelection. Now, polling indicates Elizabeth Warren and Ed Markey will become the new faces of the MA U.S. Senate delegation. The Gabriel Gomez campaign for Massachusetts Senate was doused with cold water last week when both Emerson College and Public Policy Polling put a damper on what had been a slew of good polling news. While Gomez is still in a respectable position for a Republican running in one of the most liberal states in the Union, the polls are moving in the wrong direction from where he stood immediately after capturing his party's nomination for U.S. Senate last month. In the first four surveys released following his Republican primary victory on April 30, Republican candidate and ex-Navy SEAL Gabriel Gifford never trailed his Democratic challenger Edward Markey by more than 8 points, or by less than 3 points. That is, until a Suffolk University poll emerged about a week later showing the long-term Democratic Congressman with a fairly significant, and more typical lead over Gomez of 52-35%. As written about here at the time, the Suffolk survey appeared to be an outlier. Until then, the average of post-primary polling had Markey (D) up 45-40% on Gomez (R), while Gomez's numbers with women, men, Republicans, Democrats, Independents, whites, and non-whites were all within a strong to manageable range. But over the last two weeks, the Suffolk survey has grown to look less outlier-ish and more prophetic. Since then, Public Policy Polling has come out with their second post-primary Massachusetts Senate poll, and while the topline still looked 'okay' for Gomez, the trend lines looked bad. In just two weeks, Ed Markey (D) managed to nearly double his lead (from 44-40 to 48-41%). One week later, Emerson College was out with their 2nd post-primary survey, showing a different overall result from PPP, but with very similar trend lines. They too found Markey doubling his lead in just 3 weeks, from 42-36% to 45-33%. Suddenly, Suffolk University appeared to have company. So where did Gomez's support go? Where did he experience his largest drop offs? Emerson College and PPP agree in some places on the answer, while disagreeing in others. Emerson College found a net 14 point shift of support AWAY from Gomez among men, while PPP found a net 4 point shift away. Meanwhile the female vote remained largely static in both pollster's findings. While it’s far too early to handicap the 2014 election in any serious way, registered voters currently favor the Democratic candidate over the Republican in their congressional district by 48-40 percent, the largest Democratic midterm advantage since 2006. The party saw steep losses in the 2010 midterms. The result almost entirely reflects a current Democratic advantage in partisan affiliation. Among registered voters in this survey, 33 percent identify themselves as Democrats, 22 percent as Republicans; most of the rest are independents, and they split evenly in their 2014 preference. Democrats outnumbered Republicans by 6 points in the 2012 presidential election and by 7 points in 2008, but they were even in the last two midterms – meaning the Democratic advantage holds only if their midterm turnout improves dramatically. What Mr. Langer is saying here is not that their finding is incorrect (though that is certainly possible), but rather that if it is accurate, it would break precedent. And as I've pointed out on this blog before, he's right. A Democratic partisan identification advantage over Republicans of 11 points is just very, very unlikely in a midterm election. In fact, partisan identification in every midterm election since 1990 has ranged between D+3 and R+1, a fairly tight window of difference. Because Rasmussen Reports tracks the generic House ballot question once a week, their findings are listed as a monthly average for the sake of the chart. As you can see, the average of pollsters shows the Democrats with just a 3 point advantage over Republicans on the generic House ballot, not 8 points, and with a 7 point party I.D. advantage, not 11 points. 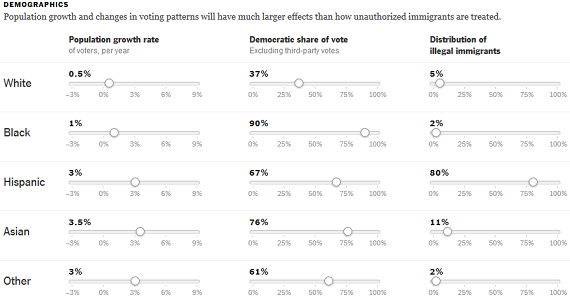 So not only is the Washington Post poll an outlier in the scheme of historical 2nd-term midterm election results, it's an outlier when compared to recent House ballot polling. While some things have changed since 1998, a lot about the North Carolina electorate hasn't, according to Public Policy Polling crosstabs. That year, fmr. Sen. Lauch Faircloth (R-NC) (left) lost after one term in the U.S. Senate to newcomer John Edwards (D-NC). Photos courtesy of Ray Lustig / The Washington Post and Brooks Kraft/Corbis Sygma. For all the chatter about the Republican's current inability to recruit a quality candidate to challenge North Carolina's junior Senator in the 2014 election, a new Public Policy Polling survey offers the state GOP with a glimmer of hope. 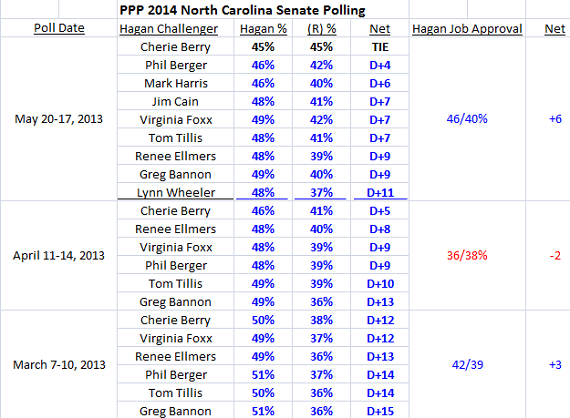 Out of the Democratic pollster's six polls on the race since December 2012, a Republican named Cherie Berry has finally managed to TIE Sen. Kay Hagan (D), despite Hagan reaching her highest job approval rating yet (46/40%). Unfortunately for pollsters and researchers, exit polling in non-presidential year North Carolina Senate races is hard to come by (in 2010, there was no exit polling because Richard Burr led Elaine Marshall consistently throughout the campaign; in 2006, there was no NC Senate race; in 2002, major malfunctions with VNS led to exit polls being off, and as a result, incredibly difficult to come by. 1998 was the last NC Midterm with readily available exit poll data). This fact is important because without such data, it can be difficult for pollsters to weight the expected electorate. Nevertheless, a frequently stated rule of thumb regarding midterms is that they typically feature a more white, less ethnically diverse, older, and generally more Republican type of voter than seen in Presidential election years. So how do PPP's most recent findings regarding the potential 2014 electorate stack up as compared to the 2012 NC presidential electorate, and the 1998 Midterm electorate? At least in terms of racial identification, the PPP crosstabs reveal an electorate that looks very similar to the one seen in 1998, when Democratic pariah John Edwards, then just beginning his political career and still well-liked, defeated 1-term incumbent Republican Senator and pig-farmer Lauch Faircloth, 51-47%. That year, 76% of the electorate identified as white, 22% identified as black, and 2% Hispanic/other. Flash forward 16 years to PPP's May survey, and the electorate is 76% white, 18% black, and 6% Hispanic/other. In terms of partisan identification, age, and gender, the crosstabs diverge from the '98 Edwards/Faircloth race, at times resembling the 2012 electorate, and at times resembling nothing North Carolina electoral politics has experienced yet. Though never known for their immense popularity with the public as a whole, the Tea Party has experienced a ratings-dive since their hey-day before the 2010 midterm election. Fortunately for them, there is some new poll data that indicates the recent IRS scandal may be providing the movement with a sympathy bump in terms of public perception. In 2010, pollsters found the anti-tax, anti-spending conservative group with an overall 33/34% favorable/unfavorable rating, while roughly the same portion of Americans either had no opinion, or refused to state their opinion. At the same time, 29% said they supported the movement, while 26% opposed it. Yet since those days when the stock market rose and fell in wild swings in a single day, when the unemployment rate peaked at a 10%, when wages plunged to a 20-year year low, public sentiment soured on the always alluring, yet always divisive grassroots movement. Following the Republican's 2010 midterm landslide, the Tea Party saw their evenly-divided favorability ratings drop to a decidedly negative 30/43% average. And though polling has been somewhat limited since the 2012 election, they've averaged an even less stellar 32/48% in the 6 months since November. Meanwhile, the margin of those saying they "support" rather than "oppose" the movement dropped 6 points since 2010. But in two surveys out after news broke on May 10th that the IRS targeted conservative groups, it appears the Tea Party is receiving a bit of a sympathy boost as a result of the perceived slight. CNN is the first to release poll findings showing the Tea Party with a notable gain in public perception. While a plurality of Americans still say they view the Tea Party unfavorably (45%), that number is down from 48% in CNN's poll two months earlier. The number of Americans viewing the Tea Party favorably has seen an even bigger jump, with 37% now viewing the group favorably, vs. 28% in March. Most of that improvement is seen among Democrats and Independents, not Republicans, oddly enough. ABC/Washington Post joined the fray yesterday with another survey showing the often demonized Tea Party with a respectable 40/43 favorability rating. 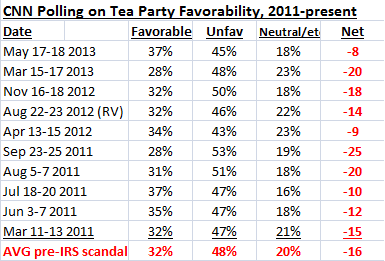 But does polling truly indicate an emerging Tea Party resurgence? It depends on which of the two post-IRS scandal pollsters you believe most: CNN or ABC/Washington Post. The Tea Party's favorable/unfavorable rating has improved a net 12 points since March 2013, the best numbers measured by CNN since 2010. Terry McAuliffe and Creigh Deeds during a 2009 Democratic Primary debate for Governor. Photo courtesy of A.P. Quinnipiac University is out with their fifth survey of the 2009 Virginia Governor's race, this time showing Democrat Terry McAuliffe with his highest survey margin yet over Republican Ken Cuccinelli. If the election for Governor were being held today, and the candidates were Terry McAuliffe the Democrat and Ken Cuccinelli the Republican, for whom would you vote? The results may surprise some, considering the barrage of negative press McAuliffe has received since Quinnipiac's last poll in March. But either Virginia voters are tuning out stories about McAuliffe's preference for Washington fundraisers over the birth of his children, or they just don't care. Because the Democrat has seen a 5 point gain in his support since March, while the Cooch has dropped 2 points. So what gave McAuliffe his largest lead of the Virginia Quinnipiac survey yet, especially in light of the perceived negative press? An initial glance at the crosstabs do little to explain the mystery, as both McAuliffe and Cuccinelli are winning similar portions of their own base, and Independents. In fact, Cuccinelli is actually doing slightly better than McAuliffe with his base, the opposing party, and Independents. But a look at the demographic and partisan make-up of Quinnipiac poll respondents sheds light on McAuliffe's rise. Simply, the current electorate is decidedly 2012-esque. The chart below documents every Quinnipiac Virginia Governor survey taken this season, including the partisan identification of the respondents of each poll. As you can see, the most recent survey found Democrats with a 10 point partisan identification advantage over Republicans. That advantage is strong enough to give McAuliffe a 5 point lead over his challenger, despite both candidates performing equally well among their own party's base and Independents. Not only does this month's Quinnpiac poll feature the largest party I.D. advantage for Democrats to date, but if it holds through November, it would represent a net 14 point shift from the last Virginia Governor's race in 2009. That year, Republican Governor Bob McDonnell defeated his Democratic opponent Creigh Deeds in a near 20-point landslide, and Republicans turned out in much larger numbers than Quinnipiac now finds. In fact, that year, it was the Republicans that held a 4 point partisan I.D. advantage over the Democrats (37% R, 33% D, 30% I). What would the new Quinnipiac poll look like had their findings detected an electorate as Republican as 2009, all other findings remaining the same? Not surprisingly, a 14 point shift in party I.D. (from D +10 to R +4), produces a net 10 point shift in Ken Cuccinelli's favor (from a 43-38% deficit, to a 45-40% lead). Incumbent Senator Mark Begich (D) (left) could be facing fmr. Governor Sarah Palin (R) in his first reelection battle next November. Photo on left courtesy of Loren Holmes, photo on right courtesy of A.P. If the Republican Primary election for U.S. Senator were held today, who would you vote for? Joe Miller, Sarah Palin, or Mead Treadwell? In a one-on-one race with the only candidate to have announced an exploratory committee for 2014 so far, Joe Miller, Palin would lead her former protege 52-19%, with 29% undecided. Given the public opinion beating Palin took after resigning as Governor of Alaska in the Summer of 2009, followed by brutal media treatment in the aftermath of the Tuscon Arizona shooting of former Rep. Gabrielle Giffords (D), it may seem somewhat surprising to see Palin positioned to win her party's nomination for office again in her home-state. But among Alaska GOPers, her favorability rating is a strong 62/30%, she's viewed as the most likely to "fight for conservative values" by 20 points, and as the "strongest person to take on liberal Democrats in Washington" by 16 points. But as the cross tabs will indicate, Harper Polling is finding a much more "conservative" GOP Senate primary electorate than the one PPP found in the immediate aftermath of 2010's contentious battle between Joe Miller and Lisa Murkowski. On August 24, 2010, Senator Lisa Murkowski (R) was NARROWLY defeated by Palin-endorsed Joe Miller for the GOP nomination for Senate, 51-49% (though Murkowski refused to concede the race until 1 week later). The rest was history, as Murkowski went on to wage a successful write-in campaign that November, defeating Miller (R) and McAdams (D) by a small margin. In the aftermath of that highly contentious Republican primary battle, PPP conducted something like an exit poll, though instead of polling Alaskan primary voters as they left the polling booths, they simply called them at their homes the following day. In that survey/exit poll of the 2010 Miller v. Murkowski primary battle, 59% of respondents identified themselves as Conservatives, 37% as Moderate, and 4% as Liberal. Now certainly, political environments can change, question wording can yield different results, and pollsters can just be wrong. And based on the disparate ideological I.D. findings of the two polling firms, one has to believe that one of those three things happened. While PPP found just 59% of the August 2010 Alaska GOP primary electorate to be conservative, 84% of Harper Polling respondents claimed to be conservative. While PPP measured 37% of the 2010 Alaska GOP primary electorate to be Moderate, Harper Polling found just 14% identifying as such. While PPP found 4% identifying as Liberal, Harper Polling found 1%. Lt. Governor Sean Treadwell and former GOP Senate nominee Joe Miller both see their numbers improve under a 2010 turnout-scenario, while Sarah Palin's decline. On June 25th the General election for U.S. Senate will be held. The three candidates listed on your ballot are Gabriel Gomez -- Republican, Ed Markey -- Democrat, and Richard Heos -- Twelve Visions Party. For whom would you vote or toward whom do lean at this time? If Suffolk is right, then Gomez must be struggling to perform as strongly with crucial groups as Scott Brown in his successful January 2010 special Senate election. The cross tabs certainly bare that out as well. While Suffolk finds the racial make-up of the 2013 special election to be very similar to that of the 2010 contest, Gomez is currently performing much weaker with white voters than Scott Brown. The latter won this group 55-44% in 2010, while the former only manages 35% in the Suffolk poll (to Markey's 53%). Considering that white's make up 85% of Suffolk respondents, an 18 point deficit with whites would demolish any Republicans chances, very quickly. The three pollsters to sample this race following the primaries found Markey leading Gomez among whites by no more than 3 points. If you average the four pollsters, Markey leads Gomez among whites 46-39% , and 54-25% with non-whites. As noted in the final row of the chart above, this won't quite cut it for a Republican upset in June. In terms of partisan identification in the Suffolk poll, while Gomez looks strong with his own party, he's not doing nearly well enough among Democrats and Independents (the only winning formula for a Bay State Republican). He only picks up 12% of Democratic voters, while barely carrying Independents 43-41%. At the same time, 19% of Republicans say they'll back Gomez's Democratic opponent. Compare those numbers to Scott Brown in 2010, and you'll see why Gomez is in trouble. Brown manged to win 17% of Democrats, while only losing 5% of Republicans to Coakley (D). But that's not what won it for him. It was his very impressive winning margin among Independents that gave him his Senate seat., carrying them by a whopping 31 points (65-34%). Since the primary, Gomez has averaged a 46-35% lead among Independents. Gov. Haley (R - SC), 2nd from left, pictured with staff for Vogue photo-shoot in 2012. Photo courtesy of Norman Jean Roy & Vogue. In all the hysteria surrounding the circus that was the South Carolina First Congressional Special Election, a little-noticed poll finding from PPP's now infamous "Colbert-Busch surging" April survey surely got the attention of both Gov. Nikki Haley and her likely 2014 opponent State Senator Vincent Sheheen (D). In the same poll where PPP found Elizabeth Colbert-Busch with a 9 point lead over Mark Sanford, Gov. Nikki Haley led Sheheen by a margin of 44-38%; much smaller than the margin by which Mitt Romney carried the first district in 2012 (58-40%), and indeed, smaller than the margin Mark Sanford eventually won the district (54-45%). Not only that, her 44-38% lead over Sheheen in a heavily Republican district represents quite the deterioration in her support since election night 2010. Now you can see why 44-38% in a district she carried by 18 points bodes very poorly for Haley, especially considering that her overall winning margin in 2010 was just four points, or 51-47%. But not so fast. Wasn't that April PPP poll widely canned in the aftermath of the SC-1 election? Remember, that poll that showed a wild fluctuation to a very Democratic friendly electorate for one survey, before returning back to it's nearly identical electorate from before in the final poll? If you agree with The New Republic's Nate Cohn and The Guardian's Harry J. Enten's take on tha April "Colbert-Busch surging" poll from PPP, then Nikki Haley can take solace in the fact that she's likely doing a bit better in SC-1 than a 44-38% lead over her Democratic challenger. To see exactly how well she COULD BE DOING, let's simply reweight the April PPP racial I.D. numbers and ideological I.D. numbers to the two survey findings that fell more in line with the 2012 SC-1 presidential electorate (their 1st and final SC-1 poll). 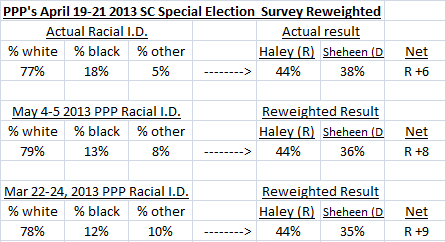 As you can see, Governor Haley would've had as much as a 9 point lead over Sheheen (44-35%) had PPP found an SC-1 electorate like they had in March. Last night, reputable polling firm Public Policy Polling (D) had one of their worst misses in months, while newcomer Red Racing Horses did little to advance their stature. They were the only two polling firms to release public surveys on the South Carolina 1st Congressional District special election between Mark Sanford (R) and Elizabeth Colbert-Busch (D). And neither was able to see that the infamous "Appalachain Trail" Governor was about to make a triumphant landslide return to Congress. To be fair, it wasn't an easy outcome to predict given Sanford's luck over the last three weeks. He was abandoned by the national Republican Party, he was competing against a pseudo-celebrity challenger, he was being outspent 5-1, and embarrassing details about his divorce to Jenny Sanford were hitting the press. Nonetheless, The Guardian's Harry J. Enten has a great post-mortem on the pollster failings in this race, specifically PPP's 2-week old finding of Colbert-Busch leading Sanford by 9 points, which as Enten notes, has the dubious distinction of being one of the worst polls taken in any special election since 2004. Enten's piece, as well as a twitter debate between The New Republic's Nate Cohn and a Daily Kos tweeter, prompted me to take a closer look at the shifting electorate reported by PPP over the three polls and six weeks they surveyed this special election. The race started in late-March with the Democrat at a very, very small advantage, which was unusual considering the partisan leanings of the 1st District, as well as the fact that PPP poll respondents looked awfully similar to the 2012 presidential electorate; they supported Romney over Obama by 56-40% (similar to the actual 58-40% margin), conservatives greatly outnumbered moderates and liberals by a 2-1 margin, Republicans outnumbered Democrats by 15%, and African Americans only made up 12% of the electorate. Last week long-time Democratic Congressman Ed Markey successfully defeated his pro-life, Obamacare opposing primary challenger Stephen Lynch 57-43%, while on the Republican side, newcomer ex-Navy SEAL Gabriel Gomez defeated opponents Mike Sullivan and Dan Winslow 51-36-13%. The candidate for US Senate are Republican Gabriel Gomez and Democrat Ed Markey. If the election was today, who would you vote for? Prior to his primary win, Gomez had trailed Markey by 15 and 19 points. Since his win, two polls have shown the race within at least 6 points, WNEU and now, PPP. In the special election three years ago, loser Martha Coakley (D) never relinquished her lead over eventual winner Scott Brown (R) until about 2 weeks before the actual election. This year's election is still 6 weeks away. So obviously, things look pretty good at the moment for Gabriel Gomez. He's starting ahead of where Scott Brown was in polling at this point in 2010, and has ample time to move ahead of Markey (or perhaps, move further behind). The two most recent, non-presidential-electorates in Massachusetts took place in 2010. Scott Brown defeated Martha Coakley (D) 52-47% that January, while Gov. Deval Patrick (D) won reelection against Charlie Baker (R) and Tim Cahill (Independent) 48-42-8%. How does the 2013 special election electorate compare to the one that catapulted Brown to victory in January 2010, and the one that helped Patrick survive for a 2nd term that November? They're similar in some, but not all ways. Information compiled from 2010 Brown v. Coakley exit polling, 2010 Patrick v. Baker v. Cahill exit polling, and 2006 exit polling.